Eighteenth-century English cooks whisked syllabubs into a froth then placed the mixture into a pot to separate. Next, the mixture was spooned through a fine sieve to drain, oftentimes overnight. Before serving to guests, the creamy foam was topped with a splash of sweetened wine. Cooks developed the everlasting syllabub: less wine and more cream. Perhaps served in individual glasses for afternoon tea, this syllabub was deemed ladylike. At the same time, some cooks no longer drained the syllabubs. Rather, they whisked the cream and wine together just before serving, which avoided any separation—creating a light dessert to follow a heavy meal. Near the end of the century, syllabubs began to lose their appeal as a dessert course for English meals because ice cream became a very popular sweet treat. “To make very fine Syllabubs. Syllabubs were also made with beer and cider. “To make a Syllabub under the Cow. 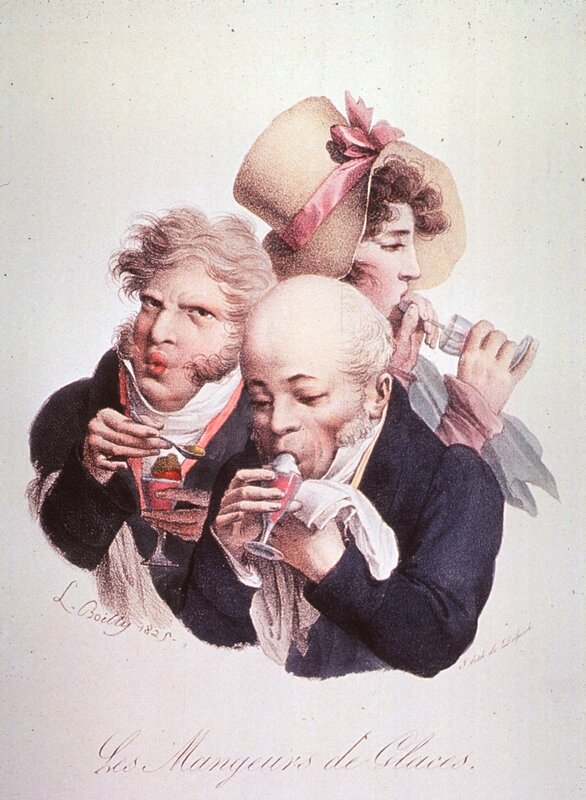 By the nineteenth-century, Americans, too, made syllabubs but with Madeira or brandy. Intrigued? Try this syllabub recipe modified for twenty-first century cooks (adapted from Eliza Smith, The Complete Housewife, and History is Served). Zest then juice one and one-half lemons into a large bowl. Add one cup of (sweet) white wine, one-half cup of (sweet) sherry, and about one-half cup of sugar to the lemons; mix until the sugar is dissolved. Add three cups of heavy whipping cream and whisk until frothy, almost to a peaking consistency. Gently fold into dessert glasses, and place at room temperature for two to three hours to allow the syllabub to separate. Place glasses into refrigerator until ready to serve. Lightly garnish with herbs. This lemony dessert calls for experimentation. From the base of cream and wine, mix in spices and herbs to taste to produce a unique retro treat for the adventurous cook. Explore more syllabub recipes in NLM Digital Collections, the National Library of Medicine’s free online resource of biomedical books, still images, and videos. Yes! Food is something we can all relate to. Thanks for reading.